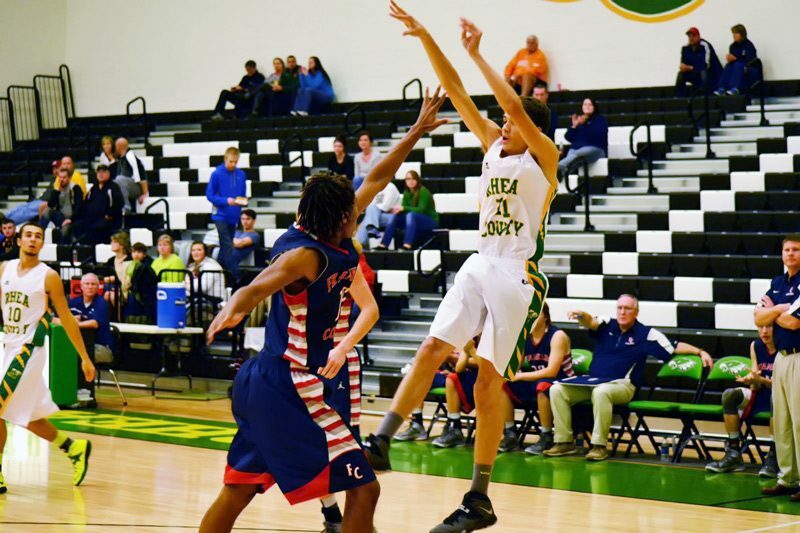 The 1st Annual Rhea County Eagle Men Holiday Hoops Shootout offered some of the best high school basketball action from our area and beyond. RCHS Athletic Director Micah Ruehling was proud to host the event at Rhea County High School’s new gymnasium facilities. The Gators from Glenwood High School, Phenix City, AL, traveled from over 260 miles to play in the event. Other schools represented in the Rhea Holiday Hoops Shootout 2013 – Men’s Tourney were Whitwell, Chattanooga Patriots, Franklin County, Hixson, Baylor, and Sequatchie County. After a solid win over Whitwell, Rhea County High School Basketball Boys lose a tough 2nd round match-up versus Franklin County. The Eagles began down early 5-2 and the visiting Franklin County team kept the lead through the first quarter at 12-8. In the second quarter the Eagles were on the wrong end of a 14-8 margin with 7 minutes to go in the half. But the Eagles fought back to take a 17-16 lead with 25 seconds to go in the half and finished the half with a slim 21-20 lead. Noel Patterson had 7 points to lead Rhea County in the first half. In the third quarter, Franklin County took back the lead 21-20 early and slowly widened the margin as the Eagles could only muster 3 points for the quarter against 15 for Franklin County. In the last quarter Franklin County went into the hold mode, being very patient with the ball and they took high percentage shots on their way to a 48-34 win. The Patterson family lead the way for Rhea County with Noel netting 9 points and Dimitrius netting 8. Also contributing for Rhea County were: Keith Hall 7 points, Greg Downey 4 points, L. Hunter 3 points, Brian Harrison 2 points and L. Hill with 1 point. The Eagles drew a tough opponent in Glenwood after their loss to Franklin County. The Gators of Glenwood cruised to victory over Rhea County, 70-45. Only two Eagles scored double digits in the contest. Keith Hall posted 11 points and Freshman sensation Jared Edwards scored 10 with 6 coming in a 4th quarter rally. Dimitrius Patterson and Logan Hunter contributed 6 points. Lee Hill – 5 points, Noel Patterson – 4 points, and Gavin Downey scored 3 points. The Freshman Eagle Team is set to play in the Freshman Shoot-out Friday, December 27th at Cumberland High School. The first game will tip-off against Warren County at 1:45pm. The next engagement for the Eagle Men will be in Tampa, FL, in the Buffalo Wild Wings Tournament, January 2-4, 2014.